While in Germany in August this year I was given the chance to part in a factory tour at Staedtler’s factory in Nuremberg. These factory tours are taking place nearly every day, but the audience seems to be predominantly school children. Unfortunately photography was not allowed for most of the tour, so there aren’t many pictures to show. Staedtler’s Nuremberg factory is just short of an hour’s drive from my home town. Here in Nuremberg they make the leads for wood cased pencils and coloured pencils, They also make mechanical pencils and lots of other pens, like the Triplus, the Pigment Liner and the Lumocolor, just to name a few. 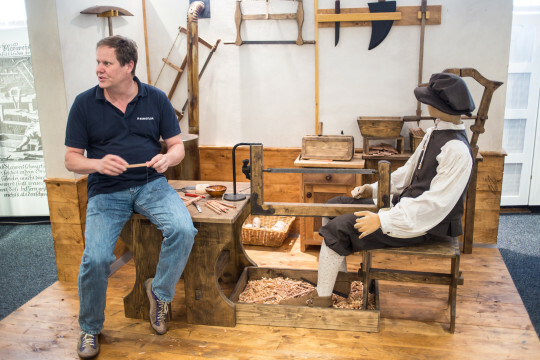 I was able to see how the leads are made, which was very exciting, but unfortunately I didn’t see the wood cased pencil production, as it takes place in the Staedtler factory in Neumarkt, approximately 50 km (30 miles) South East of Nuremberg. The leads for all Staedtler pencils are made in the Nuremberg factory. That means that if, for example, you buy a Thai-made Staedtler Minerva the lead is still from Nuremberg. Not all leads are the same though. They all use Bavarian graphite and German clay, but the better ones get, for example, a much longer oil bath. Seeing how fast the machines make the coloured Triplus (running day and night thanks to the adult colouring boom) compared to t how long it takes to make the leads for the pencils I wonder how it is possible to produce the pencils for such a low price. The Neumarkt factory used to be the German Eberhard Faber factory1, until Staedtler bought it in the 1970s. One of the reasons Staedtler sold the rights to the Eberhard Faber company was the fact that consumers associate “Eberhard Faber” with “Faber-Castell”, so in 2009 Staedtler sold the rights to the Eberhard Faber name and trademarks to Faber-Castell, who are now using it to sell their cheaper, lower quality products. Staedtler did however keep the Neumarkt factory and they are making wood cased pencils and leads for mechanical pencils there. 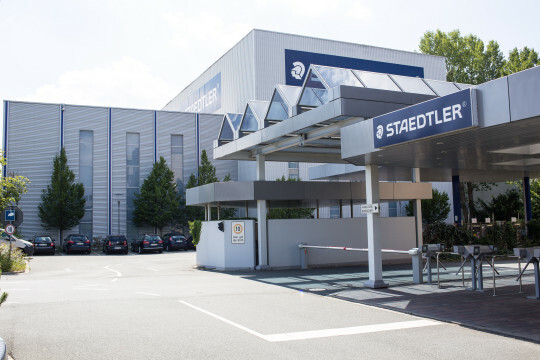 I am very grateful for the opportunity to have been part of a factory tour and would like to thank Mr Rüdel who showed us around and who answered all my questions patiently, showing great knowledge of all things Staedtler. I would also like to thank Ms Förster who also answered many of my questions, Mr Schindler, who told me about the factory tours, and Mr Hufnagl, who took the time to say hello, despite being so busy. This trip sounds like a pencil aficionado’s dream come true! It is also great that this type of tour still exists, as some stationery “museums” close permanently (Pilot’s Pen Station Museum is an example). It’s the second time I drove by the building. I think the first time was 2012, but back then I didn’t know they have factory tours. Shanching, Pilot is so big, I am surprised they don’t keep their museum open. What a shame. The tour was really great! Hello how do I sign up for the tour?? Kay, I got to know about it at the Insights X fair and asked by email. Now that the shop has opened you can probably just go to the shop, it’s just next to the workshop, and you wil probably l see even more than what I saw. Would not agree that Staedtler produces quality products from Faber Castell.Just opposite,every artist knows that crayon Faber Castell are the best in the world.Furthermore, the most expensive graphite pencil in the world is from a Graf von Faber Castell.There are still many advantages…Faber Castell is still owned by the family,while the Staedtler factory sold the factory. Stefan, I think you misunderstood. Staedtler sold the “Eberhard Faber” brand to Faber-Castell. Faber-Castell is now using the “Eberhard Faber” brand for their cheaper products. 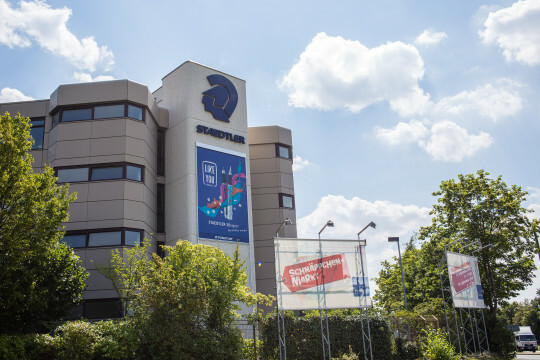 I’m seeing this post much delayed (it’s Jan. 2019), but one of my goals in life is to tour the Faber-Castell pencil factory in Stein… and now I see that Staedtler has one in nearby Nuremberg! Have you toured F-C also? Thoughts on which is better, or perhaps equally good? My primary interest is colored pencils, so I am especially interested that the cores are made in the factory you toured. Are the colored pencils assembled elsewhere? Someday I’d love to also see pencil manufacturing at the Caran d’Ache factory, but I heard that they don’t offer public tours. Thank you for your comment, Tina. nice to see you on my blog. I haven’t been much on Facebook recently, so haven’t been in contact with you for a while. Every time I go to Germany I check whether there is a Faber-Castell tour while I am in Germany. One year there was a tour while I was in Germany. The tour was booked, but in the end I couldn’t go because of an unexpected funeral. The Staedtler tour is certainly great, but I cannot comment on the difference between the Staetdler and the FC one. As far as I know Sean of https://blackwingpages.com/ and https://contrapuntalism.blog/ fame took part in the FC tour, so you could ask him for details. The Staedtler factory in Nuremberg does make colour pencil cores. They were just making red ones when I had the tour. The leads are then ‘assembled into pencil’ in Neumarkt, see my blog post above for more info. You could check my YouTube channel (link at the top right) for videos about Staedtler and stationery stores in Germany. Thanks for the tips, Matthias! I’m collecting info now, and “one of these days” I intend to get into one of those tours!